Chewigems are fun and fashionable accessories that discretely server the need to chew. 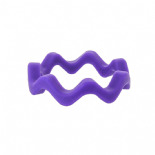 We love these funky wave bangles, so much fun for matching to outfits and the fun wave design is really cool. 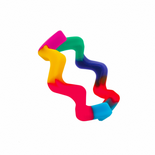 Wave Bangles are an inbetweeny-size, so they fit almost everyone - they're suitable for older kids as well as teens and adults too so we've included them in both Kids and Adults categories! These are great if kids bangles are too small but regular adult bangles are too big! 60mm internal diameter but will stretch to fit most adults!